This fragment of a bowl or dish is from Alexandria in Egypt. It dates from the 1st or 2nd century BCE and measures 38mm in height. It would appear to be contemporary with the famous Paris plate, now in the collection of the Corning Museum of Glass, although that piece was found in Syria. You will notice a small fragment of gold on the right side about half way up. The gold, though small is important, as it makes this piece the earliest example of glass gilding combined with reverse painting known to the author. Tests are planned to determine the materials and methods used when funding becomes available. 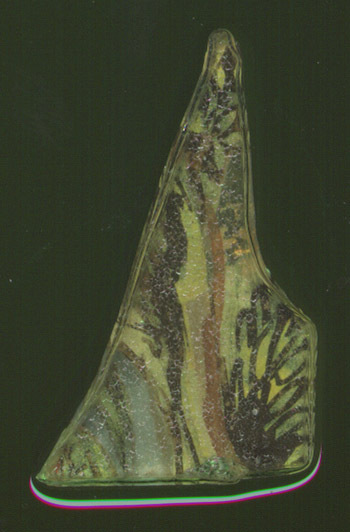 The image was scanned with a flat bed scanner with the fragment in a shallow pool of liquid (alcohol). This was done to reduce the visual dominance of surface crazing of the glass and to show the colors more clearly.